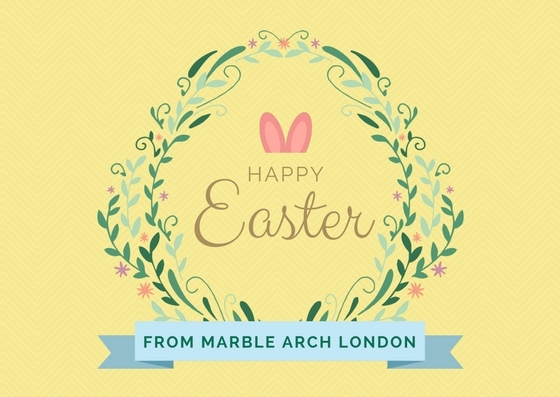 Easter in London is a very special time and even more so in the Marble Arch area! With stunning surroundings of Hyde Park in the south, lush squares to the east and west and Paddington Basin to the North, this is the place to be to feel like Spring has arrived (even if it is snowing outside). So, little bunnies, hop to it with Easter in Marble Arch. Start the Easter break right with a luxurious brunch before walking around Hyde Park, exploring the galleries of Connaught Village and Seymour Place or wandering around London. We suggest Salt & Honey Bistro for a relaxed, airy atmosphere with food that makes you feel cosy and content! There’s something for the sweet lovers(blueberry pancakes), savoury saviors(hash browns with avocado, peppers and poached eggs) or a mixture of both (french toast with bacon and banana)! Plus, as it is holiday – you have the option of a tempting bloody mary, prosecco or buck’s fizz! Of course, there’s freshly squeezed fruit juices too. There’s something about Easter that makes us want to indulge in a luxurious afternoon tea and Lanes of London has just the one! Voted as the top Easter Afternoon Tea in London by The Resident, Lanes of London promises (and delivers!) 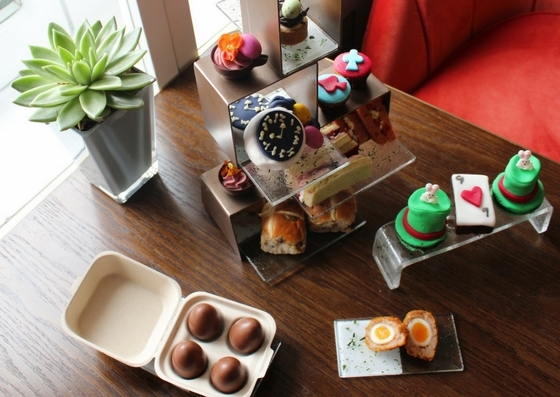 a Chocolate Afternoon Tea complete with a chocolatey treat selection including an Easter hunt Chocolate nest, Hatter Chocolate Cupcakes, and Tea Cup Biscuits! However, your savoury side can join in on the thematic fun with Rabbit Scotch Eggs and finger sandwiches of Goats Cheese, Tarragon and Piquillo Pepper, along with freshly baked Hot Cross Buns with a selection of jams. Snap up this enticing opportunity from 12-5pm on 30 March to 1 April for only £22.50 per person but for added sparkle, opt for decadent free-flowing Rose Champagne for £39.50. No one does a Roast better than The Larrik. In fact, it’s featured in the Michelin Eating Out in Pubs Guide. Not just is the food incredible, but the setting is quite outstanding too as this imposing Victorian corner pub features large wrap around windows and a gorgeous wooden bars. 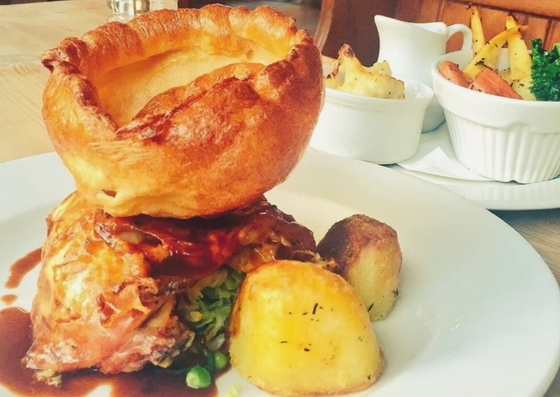 Have your pick from Roast belly of pork, 12 hour slow braised shoulder of lamb or Rare roast sirloin of British Beef with – of course – honey roast root veg, roast potatoes, Yorkshires & seasonal greens! Obviously, as a Michelin recognised restaurant, there are other delicious options on the menu, like Dorset crab on toast with smashed avocado or Rare breed pork & pistachio terrine, celeriac & apple remoulade with toasted sourdough. Don’t stop at just chocolate! 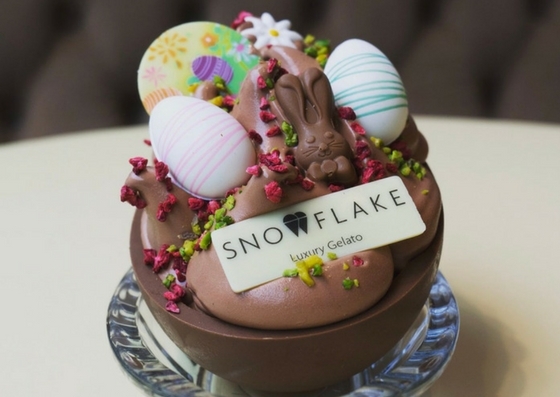 Snowflake Gelato has created a thing of beauty with their Gelato Easter Egg combining layers of chocolate gelato soft serve and caramelised pecans in a milk chocolate half shell. No holiday is complete without seasonal goodies from Gail’s and they have really pulled out all the hops for Easter! 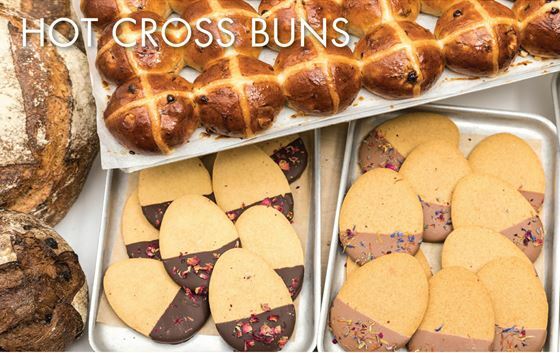 As it’s Easter, tuck into London’s favourite Hot Cross Buns (or mini buns) with spiced dough, aromatic citrus peel, currants, sultanas and cranberries before shaping and piping on the all-important cross. Of course, we won’t blame you if HCB’s aren’t to your taste, but Gail’s has thought of that with three different egg-shaped biscuits: a brown sugar sable, a dark cocoa biscuit and a shortbread all dipped in white chocolate, each finished with a sprinkling of vibrant edible petals. Lastly, enjoy their (to die for) Chocolate Sourdough, made with pure cocoa powder, bittersweet chocolate chunks and malt for a deep, tangy flavour. Pair it with lashings of butter and marmalade for breakfast. Find them in the Seymour Place bakery or order online here. PM Flowers is the place to bring spring inside! Their expertly crafted bouquets make the perfect centerpiece, hostess gift or treat to yourself! 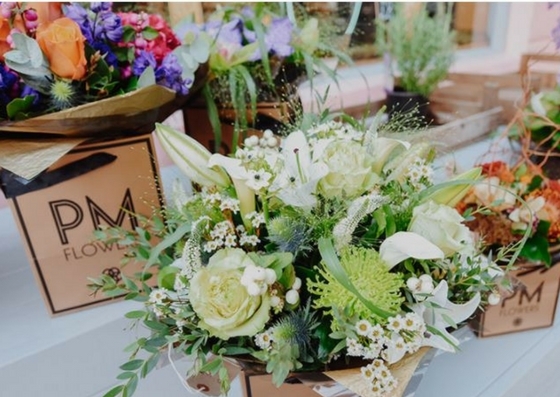 You can request your favourite florals or their designers will curate a gorgeous arrangement for you. Regardless, it’ll be glam and perk you up!